The United Nations has some advice for the starving people of the world that might bug you. Eating insects might just be the future of food. A new report from the U.N. says that eating insects (high in protein, low in fat) can help fight global warming, pollutions, and yes, hunger. And if the suggestion catches on, it could even be great for small businesses. The concept of eating insects as part of a regular diet is known as entomophagy is already practiced by an estimated two billion people, according to the report, which was issued on Monday, the U.N. Food and Agriculture Organization. In 2012, the Bill and Melinda Gates Foundation named Dr. Aaron T. Dossey’s “All Things Bugs” company the winner of the foundation’s annual Grand Challenges Explorations contest. The group received a grant to pursue its project to come up with viable insect protein options to combat malnutrition in children. So, which bugs earned the U.N.’s seal of approval? 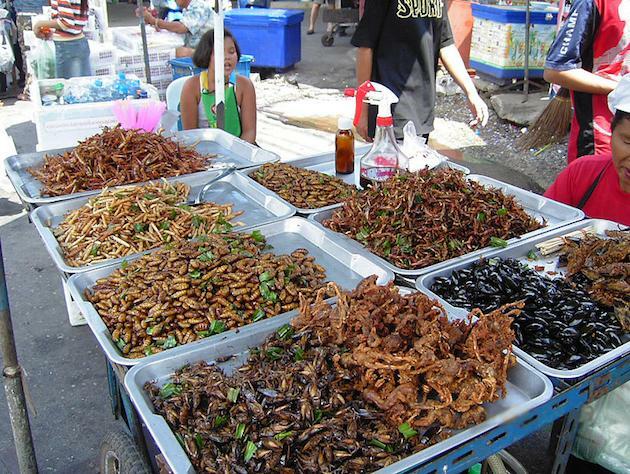 Well, there are reportedly more than 1,900 edible insect species. The international governing body suggested people try red ants, bees, caterpillars, crickets, grasshoppers, locusts wasps and certain types of water beetles. And why do insects provide a viable alternative to other livestock? That’s because on average insects product less greenhouse gas than larger animals and require a smaller ratio of food compared to the amount of substanance they provide. A Rice University study found that cultivating insects for food requires about 10 times less plant and land-mass than producing food from traditional livestock sources. And the U.N. is looking to insects for more than food. A recent $100,000 was given by the organization to study whether South African flies can be used to transform blood, manure and other organic waste into animal feed.